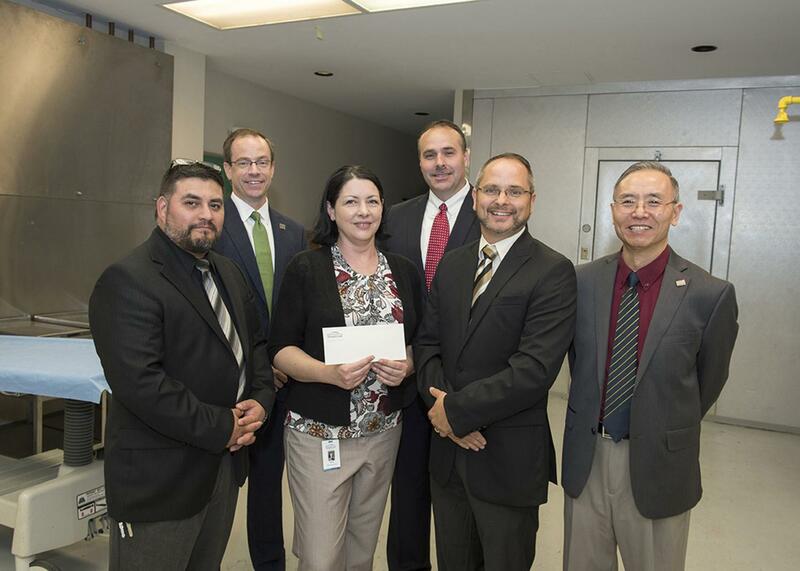 Present for the donation was Abel Salazar, clinical instructor of mortuary science (from left); Kevin Lee, vice president of community engagement, Mid-America Transplant; Carrie Hering, funeral home liaison Mid-America Transplant; Scott Collins, director, School of Allied Health; Anthony Fleege, mortuary science and funeral service program director, and Andy Wang, Dean of the College of Applied Sciences and Arts. CARBONDALE — A donation by Mid-America Transplant Foundation will mean renovations and additional equipment for Southern Illinois University Carbondale’s Mortuary Science and Funeral Service embalming lab and continued undergraduate research assistantships for the program. The bulk of a $98,000 donation presented Aug. 17 will be for renovations and equipment, with $15,000 going toward supporting students with assistantships, said Anthony Fleege, program director. This is the third year the foundation has provided support and the donation is the largest to a non-medical unit, he said. The foundation approached the program about three years ago as it identified a shared purpose in serving families and supporting the community. To date, the foundation has provided nearly $134,400 to the university and SIU Foundation in support of the Mortuary Science and Funeral Service program, Kevin Lee, vice president of community engagement for Mid-America Transplant, said. Mid-America Transplant Foundation has been “our greatest supporter and collaborator,” Fleege said. In addition to supporting students through assistantships, scholarships and board fee reimbursement, the foundation supports faculty through grants to travel and continue professional development and research. Lee said Mid-America Transplant and its foundation are proud to partner with the university “as it educates the next generation of funeral home professionals.” The foundation has shown a commitment to the ongoing development of a strong, skilled workforce within its designated services area and is continually reviewing opportunities to support students. The embalming lab renovations will provide students with one of the most up-to-date facilities in the Midwest, said Fleege, noting that there have not been “any significant upgrades” in about 40 years. The facelift will include drywall repair, paint and new ergonomic flooring. The project should be completed by Jan. 1, 2019. • A camera/microphone over each embalming station connected to a large monitor over each station and a DVR to record all embalming and restoration operations. The monitors will also be connected to a laptop computer to assist students while they are embalming and doing lab activities. • A new embalming table, so there will be four individual workstations for the optimal student-to-donor ratio.